As our name suggests, Duratrack specializes in the design and fabrication of custom industrial track and trolley systems for overhead rolling applications. 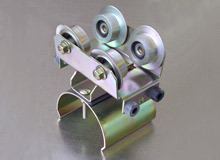 The trolley highlighted here is designed for use in a crane application. This trolley is constructed from cold rolled, HRPO, stainless steel, and black neoprene pads and bumpers. Components are produced by stamping, laser cutting, forming, CNC turning, steel rule cutting, staking, and countersinking. 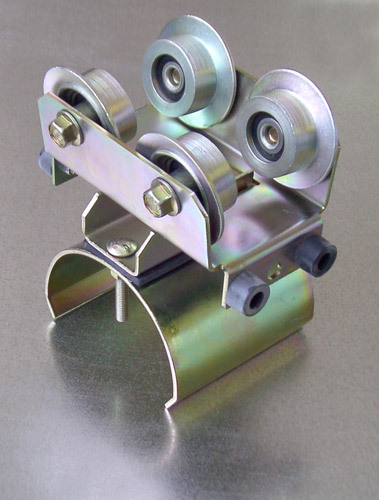 Because we have a wide range of fabrication capabilities, we are able to produce a variety of components with optimized manufacturing methods instead of outsourcing jobs or producing components in an inefficient manner. Turned parts were deburred and heat treated before zinc plating and assembly. The overall assembly is 8.50″ x 6.00″ x 12.00″ and is required to meet dimensional tolerances as tight as ±.0005″ in critical areas. Steel components were zinc plated and sealed with yellow dichromate for maximum corrosion resistance and durability. We produce approximately 6,000 of these trolleys a year with a typical lead time of 2-4 weeks. For more information about this custom industrial trolley project, see the table below, or contact us directly. This trolley is used in a crane application.